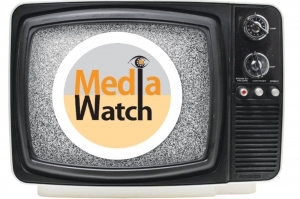 Media Watch: This guy? Seriously? No, not his finest hour. 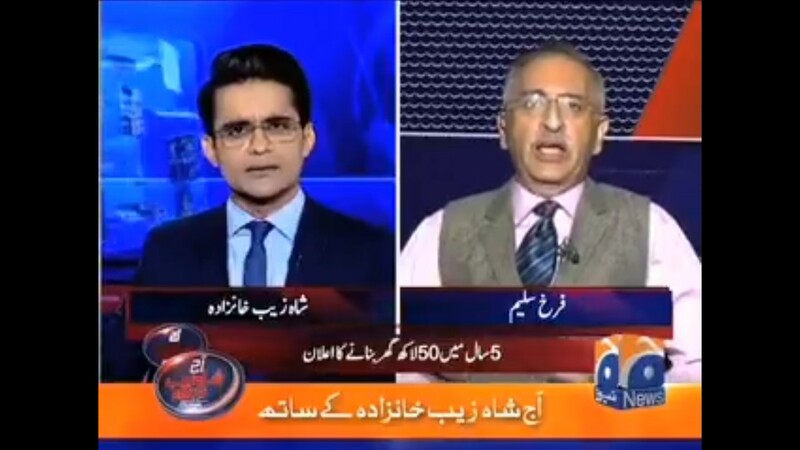 Farrukh Saleem, the newly-appointed government spokesperson for economic issues, had a tough time fielding questions from the ever-sharp, ever-unyielding Shahzaib Khanzada. Seeing the to-and-fro between the two, you wouldn’t be faulted for wondering who the “specialist” was and who the generalist journalist was. Khanzada wasn’t baying for blood or anything. He was just asking a simple question about the Naya Pakistan Housing Program. Considering that private companies would be vary of coming in, would the government subsidise it? And, if so, where would the whopping $180 billion come from? We will clamp down on money laundering, Saleem replied. Now, this could be considered a strange answer, as curtailing money laundering does not “bring in” money, but it was his line nonetheless. Remember that report on money laundering in Ausaaf newspaper that was taken up by NAB, making the latter a laughing stock throughout the country? Farrukh Saleem had believed in it wholeheartedly and had taken to Twitter to defend it. The quantum that he continues to cite is fantastic and, again, not describing how a clampdown would fill government coffers. Then, he speaks of the clampdown on corruption in government contracts. That, in his view, would also generate fiscal space! But we know your total budgetary outlay, said Khanzada. Even if corruption were completely wiped out, how would that generate the said amount? We will curtail corruption, his response again. Flustered with this approach, Khanzada called him out. When I ask an economic question, you keep giving a political response; there is no way cutting down corruption is going to generate this amount but, if you insist on this corruption bit, what has the PTI done in KP on that front, given how it shut down the provincial Ehtesaab Commission, with nothing to show for it? We’ve made a lot of advances in education, replied Farrukh Saleem. Daal sawaal, chana jawab. Incessantly. Why does the government even need a special spokesperson for finance and economy? There is the information minister, the government’s principal spokesperson. And then there is the finance minister, who can give specific answers, ones too specialised for the information minister to wrap his head around. Does having specialist spokespersons make sense? Perhaps it does. Nothing wrong with it. What is wrong is selecting “WhatsApp Uncles” for the job. If Farrukh Saleem is this government’s best foot forward, then God have mercy on the Republic. PM Imran Khan was recently reported to have gotten his media team together to deal with the economic situation! Now, yes, neoclassical economics does involve the management of expectations and spin, then, is an important aspect of that. But only to a certain extent. Is he seeking inspiration from ISPR and Pak Studies textbooks? That we did, indeed, win the 1965 war? That the dollar remains at a bearish 128 rupees and that the shadowy construct known as “the open market” was maliciously lying?